Dell has a number of ranges, with the Inspiron for home users, the Latitude for larger corporates and the Vostro aimed at small business users on a budget. The Dell Vostro 1710 (£563 inc VAT) is a desktop replacement with a 17-inch standard TFT panel. While it lacks a glossy display, we found image quality to be impressive, as the screen is bright and clear. Movies looked sharp and Word documents crisp. Being a large screen, we were expecting a high-deﬁnition (HD) display resolution rather than the 1440 x 900-pixel display it offers, but it's adequate for daily use. Graphics are handled by the mainstream nVidia GeForce 8600M GS graphics adapter, which delivers great performance for the price, so you'll be able to use this machine for games or editing video, as well as standard tasks. If the graphics sub-system is rather mainstream, there is no doubting the main processing power of this laptop. Dell has opted for a 2.1GHz Core 2 Duo which, coupled with 2048MB of memory, more than delivers on the performance front. We found this machine handled our benchmark software tests with ease and proved powerful in daily use. Running Windows Vista Business, this laptop loaded quickly and performed well throughout its test period. However, we did notice a build up of heat on the left-hand side, which results in the fan needing to run for long periods when running multiple applications. A row of touch-sensitive media buttons above the keyboard can be used to control music and movies. The built-in speakers offer good volume, but we found the sound quality rather tinny. The keyboard itself is situated to the rear of the main body and incorporates a separate numeric keypad, which is ideal if you need to do a good deal of number crunching. The keys are of a reasonable size and, while there is a degree of rattle during use, we found the keys to have a reasonable amount of travel and support. Being a 17-inch laptop we were expecting this to be a large, heavyweight machine and, while it's not exactly portable, the 3.3kg overall weight is more than acceptable. Dell has put together an effective but rather slim design that does away with bulky components – even the optical drive has a slot-loading design – and the minimal number of ports around the side of the device wouldn't look out of place on a typical ultraportable laptop. The Dell Vostro 1710 is a workhorse machine for a small business on a limited budget. 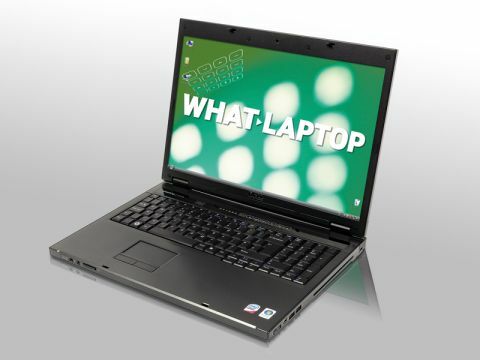 We found it a powerful laptop that ran well and offers a better than average battery life for its class.